Welcome everyone to the finale of Inuyashiki! Its been quite the roller coaster to get here, filled with sympathetic serial killers and interesting philosophical questions. So lets jump in, one last time! To start off, I want to talk about Hiro, and his ending. I’ll get into the asteroid nonsense later, for now I want to focus on Hiro. As one of the main characters, arguably the one with the most screen time, Hiro deserved a good ending. For the most part I think he got it. His meeting with Ando, up to the Asteroid, showed what he really is. A scared child dealing with the existential question of humanity. At the end, all he wanted was to take care of those close to him, to spend time with them, to protect them. He protected Ando by dealing with his bullies, he protected Shiro by stealing money and by trying to end his war with the police. What he did was terrible, there are no excuses, but you can understand why. In his final meeting with Ando, he just wanted to spend time with his friend, not realizing or not accepting that his actions had destroyed that friendship. It’s beautiful and the complete opposite of Inuyashiki. In regards to everyone’s favorite old man, his ending was beautiful and almost made me cry. The buildup to it, of him finally getting to spend time with his family, giving advice to his son, his wife seeing and accepting that this cyborg is Inuyashiki. It was all well deserved, Inuyashiki earned these moments throughout the season. He spent most of it in the shadows, helping with no thought to his own gain. Now that he is revealed he should be pushed away like Hiro, but because of the nature of his actions with this body, it’s easier for his family to accept him as human. Even though we only saw them at the start and end of the season, I actually cared about them. Because Inuyashiki, a character I am sure many of us grew to love, cared for them and showed it often. For his death itself, it had ups and downs, but mostly ups. On the downside, the bit of Hiro’s self-destruction doing basically nothing, wasting his sacrifice, was disappointing. On the other hand, Inuyashiki lying to Ando and sitting there in space completely at peace worked phenomenally. The ED fit, we see his life and his family flash before his eyes before, BOOM! Ando knows what happens and weeps, Inuyashiki’s family suspects what happens and makes simply the best ugly cry faces ever. Then? Then they all continue with their lives, not wasting what Inuyashiki has given them. His son acts on his advice, smiling after fighting back against his bullies. Mari wins the Jump competition and his wife takes up a job to feed the kids. They accepted and chose not to waste his sacrifice and I thought it was beautiful. If only they didn’t need an asteroid for it. Ah the asteroid. I had hoped it wouldn’t come to this. I had hoped Inuyashiki could end with Inuyashiki and Hiro’s final confrontation. However, as many problems as I have with the asteroid, the ending was satisfying. Yes it came out of nowhere, yes it ruined the parallel between our two leads that ran the entire season, and yes it feels terribly rushed. And yet… every time I see Inuyashiki sitting alone on that asteroid, every time I heard that ED, I get a little sad. No doubt this has more to do with our main character being lovable rather than the ending itself, but if it works it works. It made for a scenic ending where all of our supporting cast can see what happens and managed to play into Inuyashiki’s focus on fate and being worth anything. As for music and animation, it was good. Most of it we have heard before, but it was placed and used intelligently in this final episode. For animation, CGI continues to be Inuyashiki’s biggest issue, but there is at least one thing it does better than anyone else. Faces. Throughout this entire season, when focused on a character, the faces were grand. The emotions, the angles, expressions, were all great. I always knew what the characters were feeling in each scene. Inuyashiki’s serene face as he stares into space is one of my favorite shots, and the ugly crying in particular has always stood out to me. Over all, even with some hiccups and a single terrible PS2 CGI scene, Inuyashiki gets a passing grade from me animation wise. To close out, Inuyashiki ended on a high note. The asteroid felt like a rushed way to end the season, but atleast what came out of it worked well with what it was given. There were a good number of funny bits in this ending as well, such as Trump with a pretty good English VA appearing on the TV. I have to say, they nailed his impression. Over all, any ending is better than no ending, and this ending is better than most. Even with its problems Inuyashiki has been one of my favorites this season. See you soon for the final post and Happy Holidays! 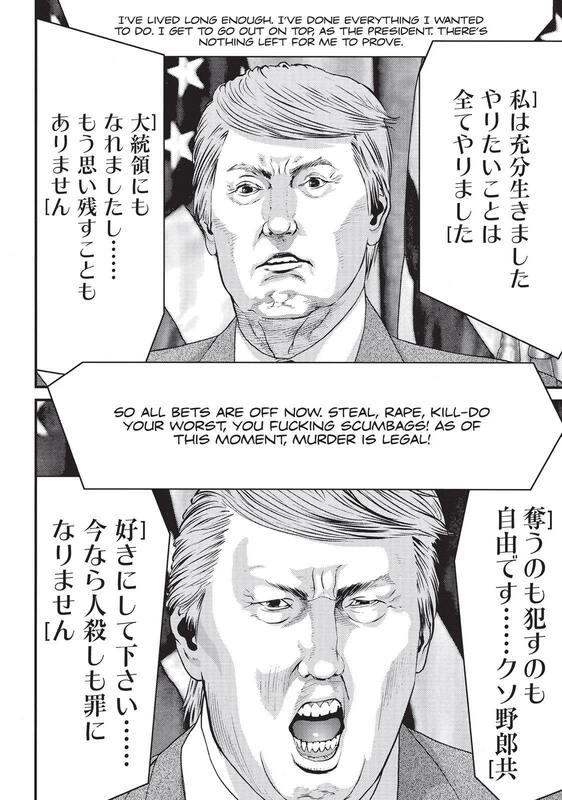 For Trump they toned down what he said in the manga. I honestly wonder if Trump would voice himself if offered. My mind says no he wouldnt, but my heart, my heart says yes. Having read the manga a long time ago, I think the asteroid was not natural. It just pops up 20 days ago and that’s it? Nobody saw it? I thin is was sent by the same aliens who make the cyborgs to cover it up. Or it’s just a hastily-conceived plot device.